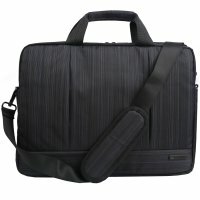 The Fashion Bag will add comfort in every day usage of your laptop. Main section of the bag is secured by velcro which will keep your laptop safe. Bag has two large external pockets with zipper as well as one inner pocket for small things. Lining has pleasant cream color. Detachable shoulder strap and carry handles allow multiple carrying options.